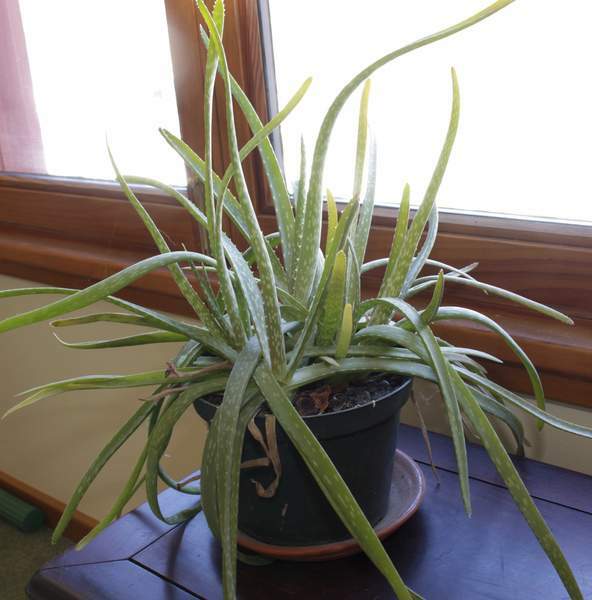 Aloe is one of a number of houseplants that tolerate a lot of abuse, so are ideal for anyone who want some household greenery but lacks a green thumb. Hints of impending spring weather might stir a desire to grow plants even in people not usually drawn in that direction. If you are one of them, yet your thumbs lack the slightest hint of green, take heart: There are houseplants even you can grow. You'll have to forgo color if you require a truly tough houseplant. Flowering takes too much of a plant's energy, which comes from good (or at least reasonably good) growing conditions, including abundant light. Don't look for color in leaves either, because plants with colorful leaves have them only when there's plenty of light so that they can do more with less green. Poor light is not the only abuse you might suffer upon a houseplant. Many people forget to water them, or water them too much. Also, as plants grow, they need to be divided and repotted, or shifted to larger pots. A houseplant for the horticulturally impaired should not grow so fast that frequent repotting is necessary. Yes, there are plants that can survive, and even look perky, with little light, neglectful or excessive watering, and little other care. And they're not all cacti. Take dumbcane and spider plant, for instance. Both are hard to kill, yet keep up appearances with little attention. Spider plant can fill its pot rapidly and send out new “babies” all over the place, but that's only with good growing conditions. For best results, grow an all-green variety of spider plant, rather than one with white stripes in its leaves. All green spider plants, with more chlorophyll, tolerate low light better. Geraniums also tolerate an amazing amount of abuse. They won't flower under these conditions, so in that case why not grow scented geraniums? Many have frilly foliage and, depending on the variety, their leaves carry aromas such as chocolate, rose or lemon. If in doubt about whether a geranium is thirsty, don't water. Cyperus is a houseplant whose especially graceful appearance belies its tough-as-nails constitution. This is a water plant, closely related to papyrus, so it cannot tolerate drying out. But watering cyperus is a no-brainer; just set the pot in a deep saucer that you always keep filled with water. Succulent plants – which include but are not limited to cacti – are obvious houseplant candidates for non-gardeners. If you've killed them in the past, it was probably because of too much water, a situation easily avoided if, when you first get the plant, you repot it with an equal volume of perlite or sand mixed into the potting soil. The perlite or sand lets water run right through the mix, making it impossible to overwater. Alternatively, repot the plant in potting mix formulated especially for succulents. Kalanchoe hardly looks like a desert plant, yet it survives neglect in proper style. The same could be said for burro's tail, ideal for hanging baskets with its ropy stems swathed in fat leaves. Jade plants respond to good conditions by growing rapidly and flowering, but they look almost the same when grown in utter neglect. Grow this succulent as a bush or a small tree. When the plant grows too large for your likes or its pot, it'll get along fine for a long time with its stems just trimmed back to whatever size you want, rather than needing to be repotted. You would think that plants called living stones would be tough houseplants – and they are. They do look like stones, however, so they might not satisfy the seasonal urge for lush greenery. Then again, if you just need some kind of garden experience this time of year, you don't need greenery. Get a decorative tray and emulate in miniature the famous Zen landscape at Ryoan-ji in Kyoto, Japan; it consists of a rectangular plot of neatly raked quartz sand surrounding artistically clustered groups of rocks.